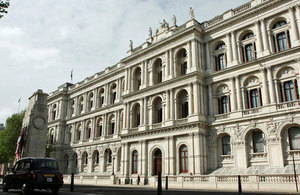 Foreign Secretary William Hague met the Deputy Prime Minister of Singapore on 30 July. “It was a pleasure to meet Singapore’s Deputy Prime Minister Teo during his visit to London for the Olympic Games - to recall together the moment seven years ago in Singapore when our bid won. I wish Singapore’s athletes the best of luck during the Games.